If you haven't read the pre-race report, it's here. The race report is here. As soon as the race was over, my dad led me by the shoulder over to the steps so I could change my socks and shoes. The band was playing, his phone was ringing and people were coming in in droves. I sat down and tried to change my shoes, but I couldn't figure out what I was doing. I took my sock off and put a clean one on and then I sat there confused for a minute and didn't know what to do next. I mean I knew that I had to change my shoes, but I momentarily forgot how. In talking to some people afterwards, they thought I was malnourished at the end. I had to conserve my Clif Shots, even though I brought 6 and grabbed two Gu's during the race. I guess my mind was playing tricks on me. Once I got that whole thing figured out, I shoved down a bunch of almonds and Clif Bars as a ton of Gatorade. I was starting to feel better. We sat for a couple minutes and then I got up to take some pictures (see below) and then we started back to the hotel. I was hobbling along for most of the mile walk, but was doing pretty well. It's kind of like when a tractor-trailer moves. It's tough to get it started but once it does, you can keep going without much effort. We went back to the hotel and iced my knees and then I got a shower. At that point my knees were killing me and the ice seemed to help. As we were walking back, I decided that I wanted pizza for lunch. And not just any pizza. I wanted the greasiest pizza with the most meat and the least nutritional value. And I wanted beer. And I wanted cheese bread. It's funny. After a race like that, all you want is food that's terrible for you. That reminds me of a pre-race item. As we were waiting for the gun to go off, a woman mentioned that she's already having food fantasies. She was planning to use most of the time during the race to figure out what fatty food she was going to eat afterwards. Ah, the things we runners do. OK, on to lessons learned. 1) I intentionally didn't use my iPod during the race. The race forbid them, but that wasn't the main reason. I wanted to experience all that the marathon had as far as sounds, etc. In retrospect, though I did get to hear things that I normally wouldn't have with headphones, I missed the music for its ability to distract me from the run. 2) Power on your Garmin early, especially if you've traveled since the last time you used it. 3) A marathon during the winter was a bad idea. New Hampshire has had one of the worst winters in history and that really made it difficult to train outdoors (and I hate training indoors). The sidewalks weren't shoveled. The cars were driving too close and the routes are limited. If anything, I'll save the long races for the fall. 1) I didn't have a specific time goal in mind, which I think was good. I expected that I'd finish around 4:30, but I wasn't too upset when I didn't. I definitely wanted to finish under 5 hours and I did that. Definitely good not to feel disappointed with the time, especially with my first marathon. 2) I secretly had a goal of not walking at all. I achieved that goal. Even though my run in some cases was a slow jog, it wasn't a walk. So, I can say that I ran a marathon. Stupid? Maybe. But it was important to me for whatever reason. I'm still quite sore a couple days after the race. My quads are killing me and I'm having a terrible time walking down the steps (like an 80-year-old man), but otherwise, I'm good. I've been taking ibuprofen regularly (per Dr. Mom's instructions) and staying off my feet as much as possible. I'm not planning to hit the roads until at least the weekend, if not the beginning of next week. I'm going to run unstructured for a while. I haven't had that luxury in quite some time and I'm looking forward to not having anything to train for. While the marathon photographers are still in the process of identifying people and publishing their photos, I am posting a few that my dad took at the race. See below. Me after the race. Note the incredibly goofy grin that I couldn't get off of my face all day. Last, and certainly not least, is a picture of me and my very proud father. In case you're wondering, yes, good looks do run in the family. If you haven't read the pre-race report, you can do so here, and the post-race report here. Warning: This post is extremely long. Please put on a fresh pot of coffee and make sure it's not decaf. There wasn't much pre-race pomp and circumstance at the starting line--no speeches by the race coordinator or anything like that, which was nice. They played the national anthem, waited a minute and then we were off. For a solid five minutes before the gun, I told myself not to go out too fast and to slow down. For some reason, it worked. I was having problems with my Garmin acquiring the satellites, so I hung back a bit at stayed at the back of the starting pack to give myself more time. There were only 1,500 marathoners and more half-marathoners that started the race at the Superdome, so we were able to get through the starting line in a couple of minutes. I wasn't bunched up with a pack the entire race. There were always people around, but I never felt like I couldn't get around them if I wanted to. That is definitely an advantage of a smaller race. It had thinned out by mile 3 or 4, which was nice. Looking down at my watch, I was at about a 12-minute mile, which was 3 minutes slower than I normally run, and probably a minute and a half slower than I did my long distance run. Again, for some reason, I didn't care. I didn't try to pick up my pace and just allowed myself to keep a slow, but running pace. The race coordinators decided to change the layout for the first time in quite a while. They added a loop through Bourbon Street and Royal Street, two famous parts of the French Quarter. That was essentially the beginning of the race and had a couple strange moments that repeated throughout the race. It was about 7:15 AM when we started down Bourbon Street. If you aren't familiar with Bourbon Street, it's a 6-8 block row of loud bars, open containers and enough alcohol to kill a herd of water buffalo. About a hundred Saturday night drinkers were still out when we ran by in the morning, still pounding cocktails. That made for quite an interesting start to the race, since we were all pumping down the street and they were trying to stay upright on the sidewalk. We turned onto Royal Street, which is a street full of funky shops. It's only a block off of Bourbon Street, but it's a world away. One of the funnier moments from the race was when a mother stopped to look at a dress in one of the windows, and the daughter reminded her that she was NOT going to shop during the marathon. Apparently, old habits die hard. We then started down St. Charles Avenue which goes into the Garden District. The Garden District has some great old homes, lots of old money and beautiful trees, etc. It was at this point (miles 3-6) when I got my first demoralizing moment of the race. Around mile 5, runners came sprinting the other way down St. Charles--the leaders of the race. That's pretty brutal to see when you're so far behind. The worse part: they had also run through the park at the end of St. Charles and were still that far ahead. Don't get me wrong. I never expected to win the race, stay up with them or anything, but seeing them that far ahead and with so much to go just to get to where they were was a tough time. We rounded the Audubon Park through miles 7 and 8. I wasn't wearing my iPod (more on that in the post-race report), so I decided to call my sister. I just needed a distraction. It helped and I think I picked up my pace because I wasn't thinking about the running so much. Finally, we headed back down St. Charles (miles 8-11) and towards the half-way point. The second of three demoralizing moments from the race was about to come. 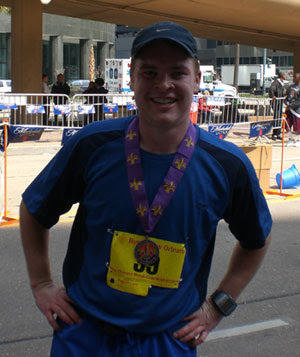 We circled past the Superdome where the half-marathoners were finishing. Now, at this point I'm definitely feeling tired and would have been happy just to be done. It was extremely tough to pass by the finish line and know that I was only halfway done and it'd be another 2.5 hours before I would see it again. 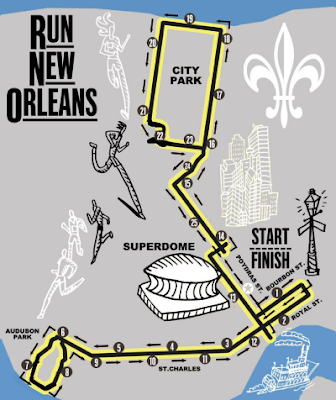 I wish they would have moved the half-marathon finish line to the other side of the Superdome or something--something so that we didn't have to see them finish. Oh, well. 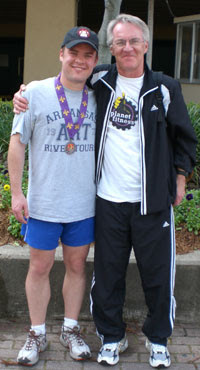 I hit the halfway point at 2:26:39, a full half-hour longer than my fastest half-marathon time. I was a bit dismayed at that, but shook it off quickly. I knew that I had a very long road ahead of me and I couldn't be concerned with time. Finishing was my only goal. We went through some less desirable parts of New Orleans on our way to City Park. As we were getting to mile 15, demoralizing moment 3 of 3 occurred. I was almost exactly 3 hours into the race at this point. Coming the other way were runners that were getting into mile 24. To know that they had already gone through the park and were almost done was really tough to take. Oh well, onward and upward, I guess. This is the part known as the "Turn for the Worse". It's emblazoned on a banner as you make the turn into the park. I was still feeling pretty good at miles 16/17, but had started to get a bit tired. Between mile 16 and 17, there was the one and only hill in the race--a 200 foot incline that went over highway 610. That was a bit of a pain, but I was determined not to walk it and power through it. I did, and passed a ton of people who just (smartly) decided to walk it. We started to round City Park at mile 19 and I was starting to feel a bit better. I called my sister again and talked with her as I hit mile 20. At the water stop there were a bunch of women and men wearing red dresses passing out cookies, Gatorade, vasoline, etc. It was a bit of an odd site. At mile 20, I said to myself (and anyone who would listen) that all I had left was a 10K. I've done 10Ks in my sleep and I was determined to pick up the pace a bit. I did, and it lasted me until mile 24 where I started to crash. I was determined not to walk at all and to push through the wall. I slowed down to an extremely slow jog and called my mother. I could tell that she was concerned for me. All I wanted was to hear a reassuring voice and hear about anything other than what I was doing. She talked about the Oscars, who she wanted to win, anything. I could tell that she was holding back her fear for my health. I talked to her until mile 25.4. I was wheezing and had to get off the phone. I called my dad who was waiting at the finish line. He couldn't hear the phone so I left a message that got me a bit choked up. "Dad," I wheezed, "I'm at 25.48 miles and I'm coming in!" I knew that I was going to do this and I wanted to finish strong. From that point forward, I had a huge smile on my face and started running as fast as I could possibly go. I was pumping my fists and yelling. I saw the finish line in the distance. Just keep going, Greg. You're almost there. You've almost finished the marathon. Still to come... post-race celebration, pictures and how to replace 3,821 calories with the greasiest food known to man. After my marathon, I've added a few miles to the ol' ticker. I'm at 780 miles and just passed Montrose, IL along Rt. 70 on the way to St. Louis where I'll pick up Rt. 44. Montrose, IL is known for, um, nothing. It has a population of 257 people and has a total area of 0.7 square miles. Yep, it's a regular metropolis! On Friday night, I had my gigantic pre-race pasta binge. With the race on Sunday, I read that two nights before is the best time to carbo-load because it takes a night and a day to really start to use the carbs. I tried to get to bed fairly early because the next couple of days were going to be crazy. I had a very early start to my day on Saturday, with a 4 AM alarm for the flight to New Orleans (through Baltimore). My dad, coming from Baltimore, and I got into New Orleans around 11:30 AM local time and headed to the hotel to check in and then for some lunch. The hotel also happened to be the spot for the Expo, which was convenient. After a bland lunch (purposefully so I didn't upset my stomach), we headed to the Expo. What a disappointment! It was in a very small room and it was obvious from the beginning that this was going to be a budget affair. Nice technical race shirt but absolutely no goodies in the bag--just pamphlets for other races. No goo, no energy bars, no great coupons--nothing. For a $75 entrance fee, I would have expected much more. They were missing an information center where we could ask questions like where should spectators go to get a good view of the race, etc. They didn't even have a detailed course for the race (see below). When asked for a street view, they told us to spend 50 cents to get a newspaper--lovely. I attended a first-time marathoner session which was OK. The one thing that the guy said that really resonated with me is that the race is a celebration of your training. It's not a test and you're not getting paid for this. Celebrate all of your hard work by finishing the race and enjoying yourself. I hadn't even thought of it that way before and I think that really helped to calm me down. I had pasta again for dinner that night with a bunch of bread. I asked the waitress to just use olive oil and garlic and to '86 the white wine. I knew that olive oil would work for me, but white wine sauce (and the extreme amount of butter that goes with it) would not. I'm very happy I kept things bland again the night before. My dad and I watched a ton of college basketball games on Saturday, which helped to relax me. By Saturday night, I was feeling pretty calm and got to sleep very quickly. Believe it or not, I think I got 6 hours of sleep before the alarm went off at 5 AM. 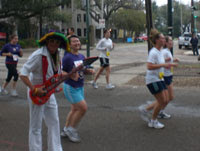 Upon waking up Saturday morning, I immediately ate a Clif Bar to get me going and we left the hotel at 6:05 AM to walk the mile to the Superdome for the start of the race at 7. We got there by 6:30 which was perfect because I didn't have to wait around too long and get extra nervous. I stretched, grabbed a little water to wash down my Clif Shot (man, I love that company) and got ready for the gun. 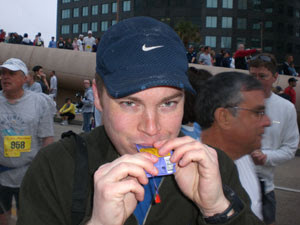 Ah, the pre-race stuffing your mouth with Clif Shots -- only a runner! One learning (among many) is that your Garmin watch has a tough time finding the satellite if you've flown a couple hundred miles from the last time you wore it. I powered it on about 4 minutes before the gun because I wanted to give it time. Well, by gun time, it was still looking for the satellites. It didn't finally grab a satellite until a minute into the race. I immediately started my watch, which was no more than 1-2 minutes after I crossed the starting mat and 6-7 minutes after gun time. Final time (per Garmin): 4:53:57. Full pre-race and race report to follow. At this point in 6 days I'll be most of the way through the New Orleans marathon. Tomorrow is my last day with running and then I'll truly enjoy the taper phase of things. Weather for race day is isolated thunderstorms with a high of 73. Quite a departure from New Hampshire with weather in the teens to the 30s... nothing like trial by fire! Well, it's official. I've finally broken up with my iPod. She and I had our good times but frankly she wasn't pulling her weight of late. The Nike+ system was constantly off and always to my detriment, so we just had to part ways. It was as if she knew that it was coming because when I tried to sync with my computer tonight, well, she just didn't want to do it. I just picked up a Garmin 205 which will replace her as of tomorrow. (Thanks for the suggestion, Petra) But, like breaking up with someone you work with (been there, done that, bought the t-shirt), I'll continue to see my iPod in the future for music. Hopefully she won't mind. Going forward, I'll just keep my stats on Garmin and will add them to the 746 miles I've run using the iPod. That said, below is my progress so far at 746 miles. I'm in Martinsville, IL continuing down Rt. 70 into St. Louis where I continue southwest for the remainder of the trip. 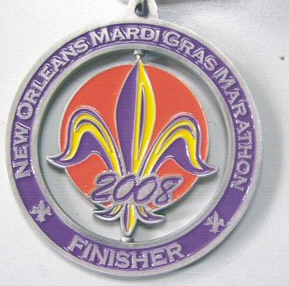 And last, but certainly not least, I'm now 9 days and 12 hours away from my first marathon -- the New Orleans Mardi Gras marathon. I'm nervous. I'm excited. I'm ready. I'll post some more details in the coming week like mile dedications and pre-marathon prep. If you have any suggestions for the last week, I'm all ears! Oh, a special thanks to ShirleyPerly who gave me some great inspirational tips, advice and confidence. You know, it's almost like she's done this before. After my run on Saturday, I surpassed the 100,000 calorie burned threshold! I started with the iPod/Nike+ system in May, so in 8 months I've burned the equivalent to 40 days on a 2,500/day diet or 50 days on a 2,000/day diet. It seems like an odd thing to celebrate, I know, but that's a threshold that I didn't think I'd ever see. It reminds me why I started to run. If you're curious (and I know you are), my menu for Super Bowl Sunday includes nachos, chips, pretzels, likely pizza and a staggering amount of beer. Is it possible to consume all 100,000 calories in one day? I had a considerably easier time making it through my 20-miler yesterday than my 18-miler a week ago. Unlike last week, I'm still able to walk, go up and down stairs and don't feel like death--all very good signs. The run was a bit slower than I would have liked, but I'm actually quite good with that. - No hills this week. A HUGE difference. - I ate some toast with peanut butter and a Clif bar an hour before I went out. - I stopped at a convenience store halfway through to get a big thing of Gatorade, so I was well hydrated. - The ice had melted so every once in a while, I landed in a huge puddle of water and completely soaked my shoes. In fact, that happened about 2 miles into the run, which was not a good sign. My feet were soaked by the time I got home. There's something to be said for carrying weights on your feet. - My iPod is still giving me problems. It screwed me out of 1.5 miles this time. That said, this week was much, much better. I'm very happy to be up on a Sunday morning not very sore. The even better part: my extreme overindulgence for the Super Bowl this afternoon won't hurt at all since I burned over 2,500 calories yesterday and had mahi and shrimp for dinner--beautiful.